Wildlife santuary Befriend an elephant, Discover the elephant's point of view. Feast your eyes on the most exotic of wildlife. And realize that there's much more to life when a deer stops to look at you, when a monkey decides to renew acquaintance, when a blue-winged parakeet sings for you. The most renowned destination is the Periyar Wildlife Sanctuary at Thekkady, one of India's major sanctuary areas. The drive to Thekkady itself is enchanting as the road winds through tranquil countryside, rich plantations and thick jungles. The sanctuary offers a lovely and comfortable way to see the animals via boat rides on the man-made lake, which the wildlife areas encircle. In addition to the wild life, there are water and land birds galore here, and one can sometimes find dedicated bird watchers setting in for one or two weeks of serious observations.Covering an area of 777 sq. km. 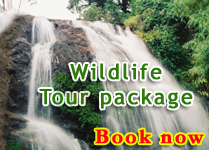 of lush green tropical forests, it is the natural habitat of elephant, bison, spotted deer, sambar, bear etc. Colourful variety of birds like the Malabar Grey Hornbill, Grey jungle fowl and the Jungle Myna are seen. The Silent Valley contains India’s last substantial stretch of tropical evergreen rain forests and it is perhaps the only vestige of a near virgin forest in the whole of the Western Ghats. 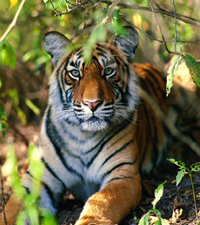 Elephants, tigers, wild dog, flying squirrel and lion-tailed macaque are found here. Vehicular traffic is allowed upto Mukkali from Mannarghat. From Mukkali one has to cover at least 24 km on foot to reach the source of river Kuntipuzha, which flows through the valley. Nearest railhead is Palghat, 75 km away. Admission to this part is restricted. Prior permission is required to visit the part. For further detail contact: The Divisional Forest Officer, Palghat. The sanctuary is situated just above the arch dam. An area of 70 sq. km. of forest land in between the Periyar and Cheruthoni rivers form an excellent habitat for wildlife. Elephants, bisons, bear, wild boars, sambar etc are found in this area. The lake on the three sides of the sanctuary offers a panoramic view to the tourists.Besides, different species of snakes including cobra, viper, kraits and numerous non-poisonous ones are also found here. Among the birds, mynah, jungle fowl, black bulbul, laughing thrush, peafowl, woodpecker, kingfisher etc. are seen in abundance. This wildlife sanctuary also houses a number of birds such as woodpeckers, black bulbuls, jungle fowls, laughing thrushes, mynas, kingfishers and pea fowls. Like any other wildlife sanctuary in Kerala this wildlife park also presents a perfect spot for a wonderful weekend getaway. This bird sanctuary is a peninsular land of 25 sq. km,formed between the branches of River Periyar. The rivers are rich in fishlife and are shallow for most of the year. The avifauna includes both resting indigenous birds and water birds. The most notable of the indigenous birds are Malabar grey hornbill, Collocalia unicolor Indian Swiftlet, Spizaetus cirrhatus Changeable Hawk-Eagle grey jungle fowl, heron, egret, jungle myna, wood pecker, rose winged and blue winged parakeet. Rare birds like Ceylon frog-mouth, rose billed roller etc. are also seen. Also called The Salim Ali Bird Sanctuary, Thattekad Bird Sanctuary was described by Dr. Ali as the richest bird habitat in peninsular India comparable only with eastern Himalayas. The bird sanctuary is rich in teak and mahogany plantation too. Located at the Devikulam taluk of the Idukki district, Chinnar received the status of a sanctuary in 1984. Stretching over an area of 90 sq. km Chinnar is home to the endangered Giant Grizzled Squirrel. Proximity to Eravikulam National Park and Anamalai Wildlife Sanctuary in Tamil Nadu makes Chinnar rich in wildlife. This sanctuary is easily accessible from Udumalpet in Tamil Nadu and Munnar in Kerala. Elephants, sloth bear, sambar, mouse-deer etc. are found in this sanctuary. It is also rich in avifauna and reptiles. This sanctuary is easily accessible from Kannur.Aralam Wildlife Sanctuary houses various species of evergreen trees like Vellapine (Vateria indica), Mesua ferrea, Mechilus macrantha, Calophyllum elatum, Cullenia rosayroona, Magnifera indica, Toona cillata, Myristica Species, Euphorbia Longana, Strobilanthes. The common trees in the semi evergreen areas are Cinnamomum Zeylanicum, Hopea parviflora, Largestroemia lanceolata, Xyliaxylocarpa, Mallotus, Philippinensis. Peppara is accessible from Vithurai on Thiruvananthapuram – Ponmudi road. This sanctuary with its rich fauna and birds is emerging as a big attraction to wildlife enthusiasts. It is spread over an area of 53 Sq. km. on the Western Ghats. This is dotted with large hills and numerous hillocks with forests and eucalyptus plantations. Elephant, Sambar, Leopard and Lion tailed macaque are commonly seen. This bird sanctuary is a peninsular land of 25 sq. km,formed between the branches of River Periyar. The rivers are rich in fishlife and are shallow for most of the year. The avifauna includes both resting indigenous birds and water birds. The most notable of the indigenous birds are Malabar grey hornbill, grey jungle fowl, heron, egret, jungle myna, wood pecker, rose winged and blue winged parakeet. Rare birds like Ceylon frog-mouth, rose billed roller etc. are also seen. Parambikulam is endowed with luxuriant vegetation. It has one of the largest population of gaur (bison),Sambar, spotted deer, jungle cat, lion-tailed macaque, common otter, sloth bear etc. are also seen. There are also a few tigers and leopards. Facilities for boarding and lodging are available at the sanctuary. There are forest rest houses at Thunacadavu, Thellikkal and Elathode. Motor transport and boat cruise can be arranged on requestThe Indira Gandhi Wildlife Sanctuary of Tamil Nadu lies adjacent. Located around the Vembanad Lake near the Backwaters, the Kumarakom Bird Sanctuary is a bird watcher's paradise. Migratory birds from as far as Siberia and also the Himalayas flock here. The Siberian stork, teal, egret, heron and darter are commonly seen. This sanctuary was set up specially for the preservation of Nilgiri Tahr, one of the seriously endangered animals.Now the number of tahrs has increased and they constitute the largest known population of tahrs existing in the world. In addition to tahr, the park shelters elephants, sambars, gaurs, lion-tailed macaque, Nilgiri langur, tigers and leopards.Accommodation and board facilities are available at Munnar, the nearest town, which is connected to Kottayam (148 km.) and Ernakulam (130 km.) by road. There is a motorable road upto Rajamalai. Further, travel is on foot, but the trekking is really enjoyable. The Eravikulam sanctuary is divided into three areas; the core area, the buffer area and the tourism area. Only the tourism area is allowed for visitors/tourists. During the Monsoon season, visitors are not allowed in the Eravikulam National Park.